How Do You Check Your Answer When You Have Two Equations? Imagine you have two equations with two variables that you're trying to solve for, and someone hands you the answer. 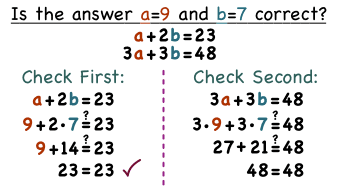 How do you know that the answer is right? After watching this tutorial you'll see exactly what it takes to check that the answer you have is correct for BOTH equations!